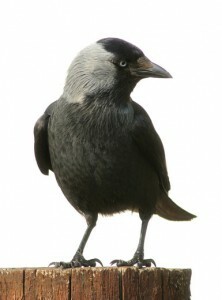 There are four main species of Corvoids (commonly referred to as crows) jackdaws, magpies, rooks and grey crows. They are social birds that can congregate in large flocks, and are quite common across Ireland. Crows are a very intelligent species, have a varied diet and are opportunistic feeders. They are commonly recognised through their distinctive calls and caws. Crows can often cause serious problems, in both urban and rural locations. As these birds are very smart and adaptable they have been found to nest in many different gaps and holes. In residential areas they often cause serious problems by nesting in attics. Once they start nesting in an attic a lot of dirty nesting material is brought in and can cause blockages and is a cross contamination hazard for water tanks. Oftentimes un-hatched eggs or chicks that do not survive can begin to rot in your attic and can cause a serious smell and again a health and safety hazard. 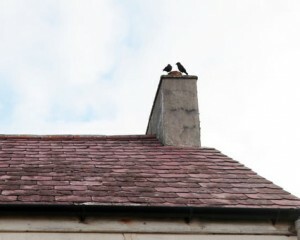 Not only do crows nest in attics they can often be found to nest in vents, chimneys and any small gaps in fascia and walls. Aside from the dirt and contamination many house owners will initially complain due to the noises and nuisance that these birds cause, i.e. pecking at windows, bird droppings down sides of walls were the entrance to the nesting areas are. In Commercial areas we have found the as well as the above problems with nesting there is also a danger of attracting colonies of crows particularly where there is a food source available. In the equine and agricultural industry there are naturally a lot of attractants available to crows. For example there is feed, water supply, roosting areas and nesting materials. Crows will go into open sheds, slatted units and stable blocks to feed and can often cause a lot of damage, leaving an unsightly mess behind them. Droppings from crows are known to carry a lot of infectious agents such as Salmonella, Cocolliosis . Rooks and Jackdaws can cross contaminate food and water not only with their faeces but they can also act as a mechanical vector by carrying bacterial contaminants on their feet and beaks which in turn can contaminate livestock feeding and drinking. This will lead to infection and disease in livestock. The presence of rooks and jackdaws in your feed lot, piggery, racing yard, stud farm or grain store increases the risk of introducing pathogens that could have a detrimental effect on the health and wellbeing of your stock. This can affect performance and growth of stock, and also increase cleaning and maintenance cost and possibly a disease outbreak. In Ireland all rooks and jackdaws and their active nests are protected by National and European Wildlife Legislation/Directives. Effective management can best be achieved by proofing the immediate area where the crows are landing or have previously nested. Nest removal is also possible for dormant nests and we will then proof the area to prevent future nesting. In commercial areas it is advisable that a Management Programme is put in place as a biosecurity measure. Wildlife Management Services have been providing effective management program in Residential sector as well as in the Equine industry and Agriculture for the last 12 years and are experts in the field. Please contact us at 087 6410206, 057 8623042 with your crow (corvoid) problem.